Poetry Breakfast at StAnza 2019: ‘Another Place’. Friday 8th March, 10am. Reading with Andrew McMillan, Lancaster Litfest 2019, Saturday 16th March, 3.30pm. Waymaking at Buxton Adventure Festival, Tuesday 9th April, 7.30pm. Mslexia Pamphlet Prize retrospective at Cornerstone Poetry Festival, February 10th 2019. ‘Unwalking the Territory’ a performance, q&a and interactive workshop with Vahni Capildeo and Harry Josephine Giles, Poetry Library, Southbank Level 5, Wednesday 6th February, 8pm. Keele Hall Reading Series, Senior Common Room, Keele Hall, Keele University, January 28th, 7.30pm. Magma Climate Change Issue reading at CCI, Cambridge, Monday January 21st 2019, 6.30pm. Details and to book a free place. ‘My time’ reading and exhibition launch at The Mitchell Library, Glasgow, January 10th 2019, 4.30-5.30pm. Reading and Discussion with Creative Writing students at Leicester University, December 8th. Reading with Kim Moore at Bookcase Hebden Bridge, Thursday November 22nd. Reading for the launch of ‘Waymaking’ at Kendal Mountain Literature Festival, Sunday November 18th, 2.30pm. Hosting a reading and discussion for ‘This Place I know’ at Kendal Mountain Literature Festival, Saturday November 17th, 11.30am. Launch of ‘Watch the Birdie’ the new Beautiful Dragons anthology covering the birds on the red list, Leighton Moss RSPB, November 16th. Reading for Magma issue on climate change, Poetry in Aldeburgh, 2.30pm, November 4th. Performing at ‘Deranged Poetesses’ edition on ‘Crones’, October 20th, ARC Stockton. Launch of the new anthology of Cumbrian poetry ‘This Place I Know’ at The Wordsworth Trust, November 17th. Launch of ‘Spark’ (Blue Diode Press) at the Scottish Poetry Library, Saturday October 13th. Kendal Poetry Festival: Reading with Kate Davis, Friday Sept 7th, 2pm, Kendal Library. Guest reader at The Garsdale Retreat for ‘Character Portraits: Escaping the Ego’, with course tutor Rhian Edwards, August 8th. Substitute workshop leader at the Rural Writing Institute (Kathryn Alto and James Rebanks), June 30th. National Writing Day workshops at schools throughout Cumbria, and with Shap Writer’s Group at The Wordsworth Trust. Waymaking Anthology Reading at the BMC tent, Keswick Mountain Festival with Kathleen Jones and Judith Brown, Sunday 10th June, 2.30pm. Wildlines festival: discussion and reading with Zaffar Kunial, hosted by Richard Smyth, at The Leeds Library, March 17th. StAnza : Past and Present Friday 9th March (talking about Jane Cooper); Border Crossing Sunday 11th March (reading my own work).I also co-lead the collective reading of Stairs and Whispers with Georgi Gill, read work by Ahmet Altan at the Scottish PEN event, and roped Matthew Griffiths into being my dance partner to perform my My Time poem at a Meet the Artist event, also featuring the outstanding Scottish Foyle Young Poets winners. Discussion & Poetry Reading February 6th. Anthology launch of It All Radiates Outwards / City Poetry Competition Results at Verve Poetry Festival, February 17th. Guest reader at Poetry Carousel residential, Grange-over-Sands, December 9th 2017. Reading with Elizabeth-Jane Burnett at Kendal Mountain Festival, Brewery Arts Centre, Kendal, Saturday 18th November, 2017, 11.30 am, Brewery Arts Malt Room. Degna Stone, Kim Moore, Malika Booker, Mark Pajak, Polly Atkin , Melissa Lee-Houghton, Pippa Little, Ruby Robinson, Zaffar Kunial, Vidyan Ravinthiran and Seán Hewitt will be introduced by Durham Book Festival Laureate Andrew McMillan. Reading with Claire Askew at Wigtown Book Festival, Saturday September 30th, 12pm, The Print Room. ‘A Perfect Mirror’: Reading and Discussion about Dorothy’s Colour exhibition, by Zoe Benbow and Sarah Corbett, at The Wordsworth Trust, Saturday September 16th, 6-8pm. Reading for Caught by The River at The Good Life Experience, Hawarden Estate, Flintshire, Saturday September 16th, 10am. Rialto Nature Poetry Prize reading at the CCI Cambridge, Thursday June 14th, 2017, 6pm. With Judge Kathleen Jamie, and winners Jemma Borg, Martin Figura, Sophie F Baker and Sue Norton. Seren 2017 Poetry Gala at Hay Festival: Siobhan Campbell, Emily Blewitt, Rhiannon Hooson and Polly Atkin, Monday May 29th, 5.30pm. and amazing music from Jenn Grant and her band, from Nova Scotia. More info here. St. Mungo’s Mirrorball, The CCA, Glasgow, Thursday May 4th, 2017. Launch of Basic Nest Architecture, Lancaster Litfest, 1pm, Saturday March 25th 2017. Reading at Vespers alongside JL Williams and Cheryl Follon, The Serenity Cafe, Edinburgh, Tuesday March 14th 2017. Nuts and Bolts Creative Writing Craft Talk on Basic Nest Architecture, University of Strathclyde, January 25th 2017. Reading alongside Sarah Hymas and Carole Coates at Brewery Poets, at the Brewery Arts Centre in Kendal, May 20th 2016. Guest reader, Poetry in Grasmere, April 13th 2016. Workshop ‘ERASING THE LAKES: writing by un-writing’ for Campus in the City, Lancaster, May 7th 2016.This workshop for all ages took texts about the Lake District and encouraged participants to find their own erasure poems within the text. Reading with Rebecca Tamás and Elizabeth-Jane Burnett, Landscaping Change, Bath, March 29th 2016. Lancaster Litfest showcase for Beautiful Dragon‘s anthology My Dear Watson: Elemental Poetry, 2pm, Saturday 19th March 2016. Reading at Garrigill village hall in aid of the Cumbria Flood Recovery Appeal, 7.30pm, Sunday February 21st 2016. Launch of My Dear Watson: Elemental Poetry, The Anthony Burgess Centre, Manchester, 5pm, November 27th 2015. Café Writers Prize Reading, Norwich, February 9th 2015. Poetry workshop and reading, University of Ghent/Gent Poëziecentrum, November 17th 2014. Wigtown Book Festival, Poetry Prize Reading, October 4th 2014. Interviewed live on Fylde Community Radio, A Poetry Show, July 12th 2014. Launch of Wordpool‘s first poetry competition, Blackpool Central Library, July 4th 2014, and award presentation, October 2nd 2014. Reading with Gregory Leadbetter at St Mary Magdalene Church, Cannington, to participants in the Coleridge Summer Conference, July 28th 2014. Poets and Players Award Reading, John Rylands Library, Manchester, June 21st, 2014. Reading at launch of Heavenly Bodies: an anthology of stellar poems, one for each of the constellations, Judges Lodgings, Lancaster, April 30th 2013. Reading at the Brewery Arts Centre in Kendal as part of the Quiet Compere tour, April 26th 2014. Reading at April Poets in Lancaster, April 10th 2014. Reading at Moonlighting II charity event, Lancaster University, with Jenn Ashworth, Zoe Lambert and Eoghan Walls, 5th December 2013. Reading at launch of Holy Detritus exhibition at St. Oswalds, Grasmere, 27th September 2013. Reading at Greenbelt Festival, 26th August 2013. Poem ‘Redwoods’ included in Beneath the Boughs poetry exhibition, Lowther Castle, July – September 2013. Reading for delegates at the 2013 Southey Conference, Robert Southey and Romanticism: The Lake School in Context, 29th July 2013. 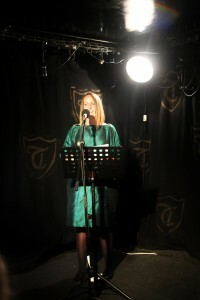 Featured Poet at Wordsworth Trust/Zeffirelli’s Open Mic, 10th July 2013. BBC Radio 4 Woman’s Hour – Discussion on the role of Aunts in Literature, with Vona Groarke, 10th May 2013. Shadow Dispatches Launch, with Judy Brown, at The Wordsworth Trust, 20th April 2013. Solstice: 24 hours of poetry from the longest day 2012 launch, Lancaster Judge’s Rooms, 20th March 2013. Hosted reading and Q&A with Jamie McKendrick, Tom Warner and Èireann Lorsung, Nottingham Festival of Words, 16th February 2013. Reading with Paul Farley, Jenn Ashworth and George Green at Moonlighting, Lancaster University, 6th December 2012. In support of The Twins Appeal.